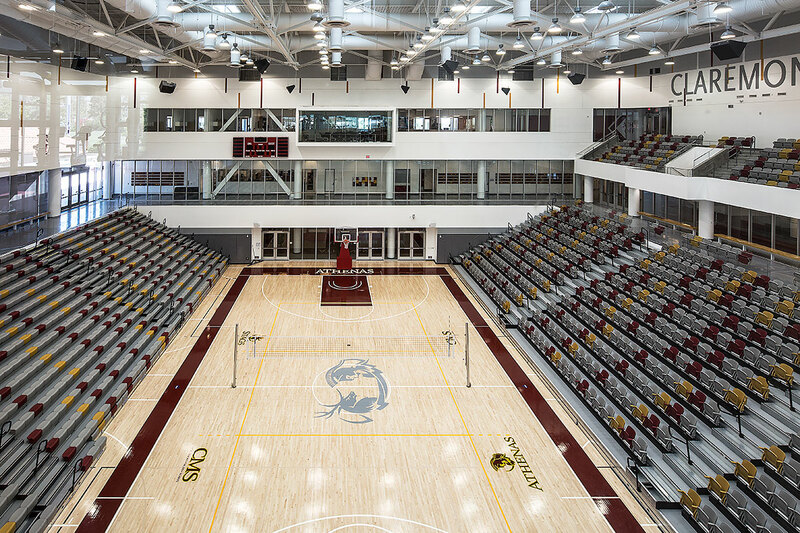 Named in honor of Claremont McKenna College (CMC) Trustee and alumnus George R. Roberts, Class of 1966 and parent of a 1993 graduate, Roberts Pavilion is the spectacular new fitness and events center for CMC. It also serves as the home of Claremont-Mudd-Scripps intramural programs, physical education classes, and intercollegiate athletics. CMS ranked 10th in the nation last year in the NCAA Division III Directors’ Cup. “We are both humbled by the generosity and accomplishments of so many who helped realize this vision and inspired to take the fullest advantage of this gorgeous, dynamic, multi-purpose college facility,” said Hiram Chodosh, President of Claremont McKenna College. Designed by the award-winning design firm John Friedman Alice Kimm Architects, the LEED Gold-certified 144,000 square foot Pavilion features a state-of-the-art fitness center and a spacious events arena with a seating capacity of approximately 2,200. Besides athletics events, the Pavilion will house major college and community events, including convocation, student orientation, career fairs, and concerts. Roberts Pavilion was designed to embody the values of the Claremont-Mudd-Scripps athletic program and Claremont McKenna College itself. Upon entering the facility, visitors encounter a quotation from its namesake, George R. Roberts, a successful businessman and financier, that broadcasts the building’s ambition: “Whatever you do, go all in.” A two-story “word wall” denotes core values in the 10 most spoken languages at Claremont McKenna College, underscoring the College’s dedication to global liberal arts education and an enduring commitment to community, excellence, and leadership. In referring to the wall, architect John Friedman said: "Initially taking cues from President Chodosh's musings on CMC’s key aspirational values, we conceived of [it] as a spatial, graphic, and artistic representation of those aspirations, as well as [an inspiration to the] scholar/athlete/artist/citizen that forms the core of the CMC community. "Like the gymnasiums of classical times, but updated for the contemporary world, this feature was designed to speak to the creation of the complete human being, the whole person, that is the primary and ultimate raison d’être of the college experience." Among other features, the building houses a three-story, 10,000 square foot fitness studio with more than 60 treadmills, cross-trainers, exercise bikes, climbers, rowers, weight machines, and other cardio equipment. The facility also offers a 4,500 square foot strength training room as well as large exercise rooms for yoga, aerobics, spin, dance, and other group classes. The dedication begins at 2 p.m. with a series of community events, including musical performances, interactive activities, and tours of the facility. The ribbon-cutting ceremony is at 4:30 p.m. and a celebration reception and dinner will be held on CMC’s Parents Field beginning at 5 p.m. For more information about the Roberts Pavilion Dedication Ceremony, please visit the Roberts Pavilion website.